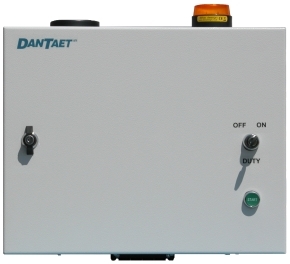 DanTaet system CSLP monitors the water consumption at the construction site 24/7, minimizing the risk of expense- and delay-incurring water damage, and avoiding unnecessary water wastage. System CSLP is installed at the site when it opens. The systems meter and valve (which are chosen to suit each individual building project) are installed in a well or in an above-ground, frost-free location, and connected to the controller which is located nearby where mobile coverage exists, and from where its alarm lamp is easily seen. After hooking up to the electrical mains, and after an advisory phone call to DanTaet, the system is operable. System CSLP monitors and responds depending on whether the site is manned or not. When manned, a higher consumption is allowed, and the system will issue alarms without cutting off the water supply in the event of a limiting value being exceeded. When the site is unmanned, only a modest consumption is allowed, and the installation is cut-off when a limiting value is exceeded. Optionally, a text message may be sent via the mobile network. The system is highly flexible and can be adapted to most requirements. No special skills are required to operate the system, which is sold including DanTaet remote support, so that all settings, adaptations and adjustments are done by DanTaet via the mobile network at the customers' request. If so desired, when construction is finished, the system's meter and valve may be used in the leakage protection of the property itself. An insurance discount may be available when protecting the construction site from leakage; please inquire with the relevant company.